What are you using for your CCR enclosure ? Do you put all 12 in one enclosure ? I do. I have mine screwed down on a wooden rectangular TV dinner table & I put a tote box over top. The power supplies are in water proof army 1st aid boxes & I drilled holes to get the wires to the ccr controllers & for the plugs. I screwed two power bars on the bottom side of the table & plugged the cords in them, & then I put the two army 1st aid boxes under the table. That worked well for the Matrix these past two years. However this time because I am going with a 16 ccr tree I may come up with something new, unless I hide the table behind the ccr tree. I was looking online at our local Sear store, and found this tool box, and I think it just might be perfect for 12 CCR's controllers and 2 power supplies. That would work or the Stanley Fax Max Tool Box because it is suppose to be water proof. It has a orange or yellow seal around the inside of the lid. I may need to switch to that for this season. Yes, I saw the Stanley tool box at Lowe's. Thinking that would be perfect also. 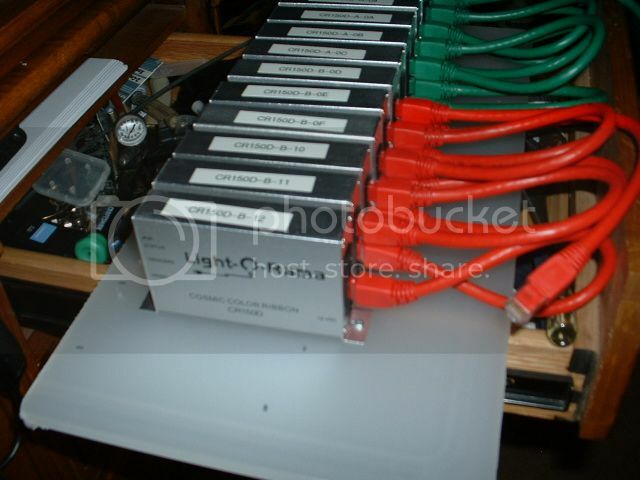 I have started mounting my 12 CCr's, There are attached to a plastic cutting board, and are linked together using 1 foot cat-5 cables. I also used 1 foot cat 5 cable. It s looking good. I agree, you did a nice job!!! I may need to do a make over on mine, but first I want to finish my mini (4 foot) Ferris Wheel, & then a Carousel, & then a frame for either a ccr tree or a ccp tree, & if I have time say in early November I may get to the modifying of the ccr controller cabinet. Thanks guys, now I need to start on my CCR frame. Today was the first day to test my CCR enclosure in heavy rain, and the inside was bone dry.